Mixed box contains 8 packs of day pads, 7 packs of night pads and 5 packs of liners. Drion pads and liners contain more than 6000 negative ions and far infrared energy; killing bacteria in the reproductive tract and keeping blood and energy moving in the pelvis. Supporting healthy menstrual cycles. 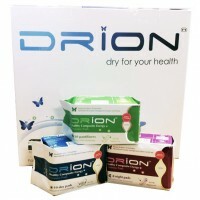 Drion pads are the most absorbent pad available in NZ.